The launch of Buzz left Google with a black eye over several privacy mishaps. The main source of angst was the exposure of user Gmail contacts, and Google's rushed tweaks just weren't good enough. Now Google wants a total re-do--and perhaps forgiveness--with the implementation of even further fixes. In a blog post, Todd Jackson, a Google product manager, apologized for Buzz's sloppy debut. "Shortly after launching Google Buzz, we quickly realized we didn't get everything right and moved as fast as possible to improve the Buzz experience." He then outlines the changes made to improve the Buzz experience: "Rather than automatically setting you up to follow the people you e-mail and chat with most, Google Buzz now suggests people for you to follow instead. This way, Buzz is still simple to set up (no one wants to peck out an entire social network from scratch) but you aren't set up to follow anyone until you choose to do so," Jackson wrote. For those who have been Buzzing already, Google has employed a pop-up screen that will appear the next time you log in, asking you to double-check your privacy settings. 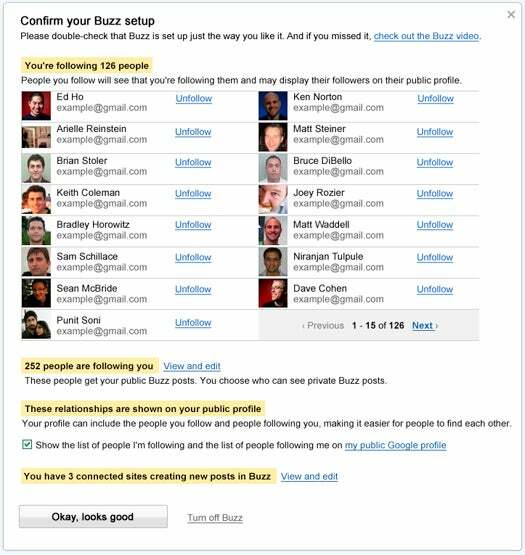 This birds-eye view of Buzz shows who you're following and who's following you. You can "elect whether you want [follower] lists appearing on your public Google profile, and modify any of the sites you have connected to Google Buzz, like Picasa, Google Reader, or Twitter." No worries if you don't make the right decisions immediately; you can always fiddle with your settings later. Is this all too little too late? These modifications won't hush the eleven U.S. lawmakers who have asked the Federal Trade Commission to investigate Google Buzz. The FTC has been very vocal with its contempt for Google Buzz, calling the company "irresponsible" about privacy. At the very least, you have to give Google props for quickly grabbing the band-aids. Buzz may be flawed, but it could be on its way towards maturing into a valid (and safe) contender in the social networking arena.